After a few weeks of preparation, it was finally time to support my first field seminar, Intro to Wolf Management and Ecology. Since the reintroduction of wolves to Yellowstone in 1995, debates relative to this alluring creature have been tireless and complex. 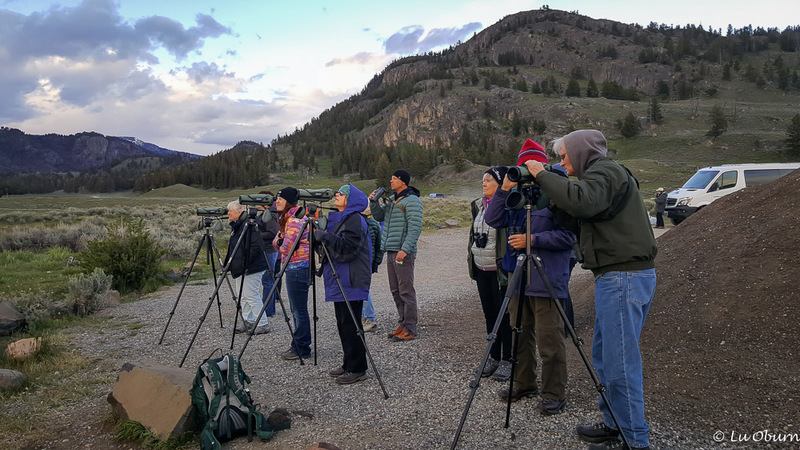 Wolf watchers in the park are enamored by them, ranchers and hunters not so much. Sunrise at Slough Creek, site of an active wolf den. I had heard several park employee discussions on the topic of reintroduction of the wolf, namely Doug Smith, project leader for the Wolf Restoration Project, since our arrival to the park. He has studied wolves for the past 20+ years and still brings the same passion to the topic as he did as a Yellowstone freshman. I was anxious to hear some fresh views on this subject from our class instructor, Jon Trapp. Beyond embracing many of the views presented by Doug, Jon also spoke on the topic of wolf denning, subject of his master’s thesis. Our classroom time took us through the past couple of decades since reintroduction, how many of the wolves have been collared and tracked, the family dynamics of how they hunt together, and what happens when an alpha member of the pack is killed. It was most informative and supporting this field seminar added another dimension to my time at the Buffalo Ranch. Wolves get a bad rap, some of it deserved, as they do kill some livestock. No rancher wants to work hard to grow their herd, only to have a predator take from him. The good news is that when this happens, the rancher is compensated for his loss. Hunters who share the sentiment that the only good wolf is a dead wolf feel that the elk population has been jeopardized by the reintroduction of the wolf. It is true that the mainstay of the Yellowstone wolf’s diet is elk; however, statistics have shown that many more elk are taken down by cougars than wolves. I learned that 85-95% of the time when hunting an elk, the wolf is not successful, and their elk hunting is compensatory, killing weaker elk who were most likely going to die anyway. Our field studies were the most exciting, taking us to an area of the park where we could view an active wolf den using spotting scopes. Watching the pups emerge from the den, tumbling over one another, frolicking in the sunlight, delighted us all. Jon also took us to one of the first acclimation pens, Rose Creek, where we read the story of the first alpha female to the reintroduced to the park. On another outing we inspected an abandoned wolf den. With the wolf’s return to the world’s first national park, Yellowstone has regained its balance of historic mammals and is now described as the largest intact ecosystem in the temperate world. We now see this region as it was before the Europeans arrived. 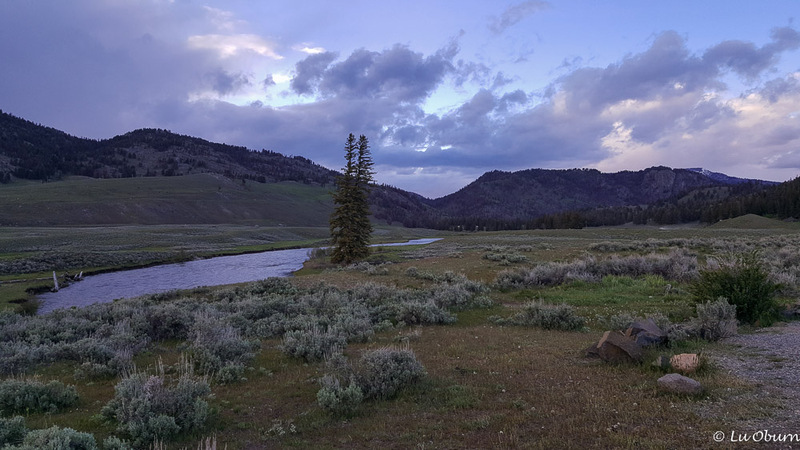 Biologists and scientists spend significant time in the field tracking the wolves of Yellowstone, but in the end what matters most is that we carved out another little piece of wildness with their reintroduction. We need these wild spaces, their coarseness, erratic ebbs and flows, the magic and mystery. 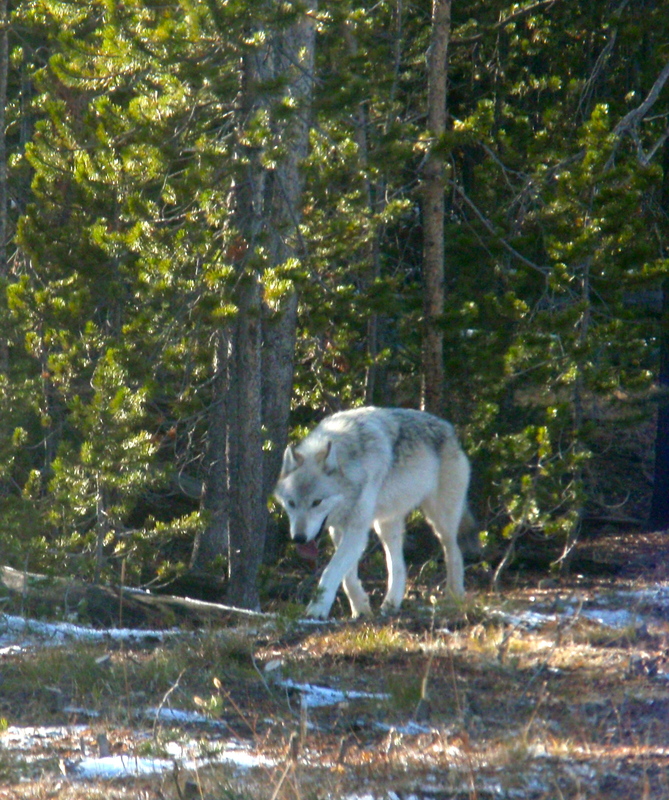 Photo of the white wolf from September 2010, recently shot and killed within Yellowstone NP. Very interesting Lu! You must be absolutely loving your time in Yellowstone! We are having a very busy and very interesting summer. My only complaint is the lack of internet. We have to go to Gardiner to connect most often and with our schedules that is difficult. Being at Lamar Buffalo Ranch makes it much more palatable. I know the reintroduction of wolf’s has been a hot topic. Thanks for sharing this interesting info. They are beautiful animals. And I always appreciate your lovely photos. Sounds fascinating LuAnn! I would absolutely love to do this kind of class. We have a wolf institute up in Ely, MN near the Canadian border. We didn’t get to visit last summer when we were there but plan to next month. I’m looking forward to it. Hope you are having a wonderful time there! We visited the wolf institute when we were in Ely. Loved it! It has been quite the summer so far here at Yellowstone. I think it’s wonderful that the wolves were successfully reintroduced to Yellowstone. Your “job” sounds so fun and interesting! It has been busy and we are learning so much. Wish the internet weren’t such an issue. Not sure when I will be able to post again. Thanks Frank and Margee. We are having a wonderful time. Great entry, LuAnn! And I love Jon Trapp! He does an excellent job of teaching about wolves. He worked for Montana FWP as a specialist and I am sure he has lots of stories about that time in his life. I am glad you got to support his class. 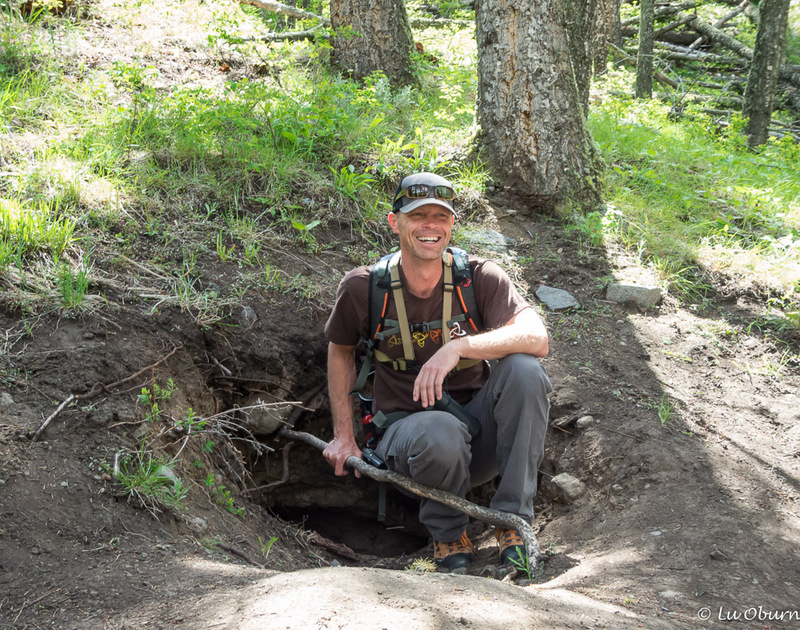 And the good news, at least for me, is that I am going to support your “Off-Trail Hiking on the Northern Range” class also. I can’t wait! Love that you are learning so much about the wolves. I know it’s illegal to kill a wolf in the park, but are people allowed to kill a wolf, if it leaves the park? Are the wolves only protected inside the park? I know a lot of them have left the park and found other homes, but I don’t know what their chances are, of surviving. I sure would have loved to do this kind of volunteer work, when I was younger, and I’m so glad that I can do it now, through you. Thank you so much, for sharing your experiences. Waiting with baited breath, for your next chapter. Wolves are fair game if they leave the park. The last wolf killed was inside the park and there is a big reward out for information about who killed it. The wolves chances are not as good once they leave the park. I will try to post again when I can. My schedule and the lack of internet is making that challenging unfortunately. Hope all is well with you. What an interesting summer you are having! I understand that the wolves reintroduction was controversial, but it was so necessary for the food chain balance. The top of the chain was missing and the elk had no predator, so it was a trickle down effect. But it is easy to see the farmers point of view. Guess there is no middle road. Thanks for sharing. Please continue to sharing your learning!! LuAnn wonderful to see and hear more about your summer. The reintroduction has certainly garnered attention. Looking forward to hearing more about your summer! I am so happy that you’re doing this work and helping those species hold their rightful GPS spot on the planet!! Thanks Z! I am totally with you. Hope all is well with you. We saw a special on the reintroduction of the wolf. It was so interesting. Great work, girlfriend. Thanks so much for your dedication to this project. My pleasure. Hope you and Paul are doing well and enjoying your summer. Wish internet would allow me to keep up with all of you. This is so fascinating — I knew that reintroducing the wolves is controversial in some circles, but it seems as though since any losses caused by the wolves are compensated by the government, it shouldn’t be an issue! I loved reading that with the introduction of the wolves, Yellowstone is now the largest intact ecosystem in the temperate world. That’s absolutely amazing. Wish we could restore balance to more of our planet. We are having such an interesting summer – learning so much. Internet is the only challenge. We most often have to drive to Gardiner for it and with our schedules that has been challenging. Hope all is well with you and Eric. Wish I could catch up with all my blogger friends. Thanks Anita! We are having an inspiring summer and a very busy one as well. The only drawback is not having access to the internet more so I can blog more often and keep up with all of you. Rest assured I will be back to see what is going on in your lives as soon as I am able. Thanks so much for the book suggestions. That is something I can do when internet is fleeting. Thank You LuAnn ! another wonderful post and one that I am so interested in. I remember so well upon leaving Arizona for Yellowstone I had 2 wishes for my to-be experience of working there for the summer, First to see a moose and second to get to hear a wolf. I never dreamed that I would actually see them I was happy to just get to hear one and when I heard my first wolf howl I was with Rick M. and just fell to my knees with tears in my eyes. It was so awesome! Yellowstone really is a magical place. Nathan Varley is here right now doing a wolf class. Lucky those few who get to spend time with him. I read an article about the wolves in Yellowstone a few years ago in a National Geographic. I found the arguments over the wolves interesting and like seeing them there if for nothing else than the amazing photos people take. I too read the Nat Geo articles on the Yellowstone wolves. I believe the photographers who took those photos were here for a few months before those articles were written. What a fascinating read! Thanking for sharing. I look forward to following the National Park’s continued progress with the wolf reintroduction. Great post to read! Wolves are amazing creatures and great to see that they are getting to come back in the park. How very fortunate you were to have been able to see an active den! What wonderful memories you are making! We loved our summer. Some days were long but what we learned and the people we met far outweighed any tiring days we had.